Dr Marco Ruffini, CONNECT Funded Investigator at Trinity College Dublin, has led a team to victory at the OFCity Challenge at OFC in San Diego, California. Marco led a team called “ALIVE” which included Thomas Pfeiffer (Nokia Bell Labs, Germany); Dave Hood (Huawei, USA); Junwen Zhang (ZTE, USA); Daniel King (Lancaster University, UK). The Augmented Living Experience (ALIVE) team is tackling the challenging problem of delivering highly predictive deterministic packet transport for high fidelity acoustic and video applications. Our use cases are based on the requirement to schedule connectivity and maintain specific low latency network guarantees for remote multi-site locations for real-time concert rehearsals, and sport streaming. We achieve our objectives by employing a software-defined controller over a hierarchical multi-layer network architecture that utilises transparent metro optical switching, and strict-QoE traffic engineered packet paths across packet core infrastructure. Guarantees are provided via in-situ OAM monitoring and feedback to the controller. Network connectivity is complemented with sound and augmented reality (AR) video processing and synchronisation methods, tightly interacting with the network controller which modifies QoE paths accordingly and ensures seamless protection switching. Additional key contributions include integrated fiber-wireless access network and Geo-distributed Fog Computing technologies, which allow predictive network connectivity for time-sensitive and ultra-reliable communications such as: autonomous vehicles, localised content delivery and live augmented reality concert and sport streaming. Team ALIVE will present a cost-effective solution for smart ultra-low-latency communication providing a long-lasting legacy to OFCity, demonstrating its technology leadership in the area of 5G smart cities for many years to come. Avishek Nag, Yi Zhang, Luiz A. DaSilva, Linda Doyle, and Marco Ruffini, “Integrating Wireless BBUs with Optical OFDM Flexible-Grid Transponders in a C-RAN Architecture“. Accepted at OFC 2017. Amr Elrasad, Nima Afraz, and Marco Ruffini, “Virtual Dynamic Bandwidth Allocation Enabling True PON Multi-Tenancy“. Accepted at OFC 2017. A. Saljoghei, Arman Farhang, Colm Browning, Nicola Marchetti, Linda Doyle, and Liam Barry, “Investigation of the Performance of GFDMA and OFDMA for Spectrally Efficient Broadband PONs”. Accepted at OFC 2017. Irene Macaluso, Bruno Cornaglia, and Marco Ruffini, “Antenna, Spectrum and Capacity trade-off for Cloud-RAN Massive Distributed MIMO over Next Generation PONs“. Accepted at OFC 2017. Colm Browning, Alexander Gazman, Vidak Vujicic, Aravind Anthur, Ziyi Zhu, Keren Bergman, and Liam Barry, “Optical circuit switching/multicasting of burst mode PAM-4 using a programmable silicon photonic chip“. Accepted at OFC 2017. This entry was posted in News on April 4, 2017 by Nima Afraz. 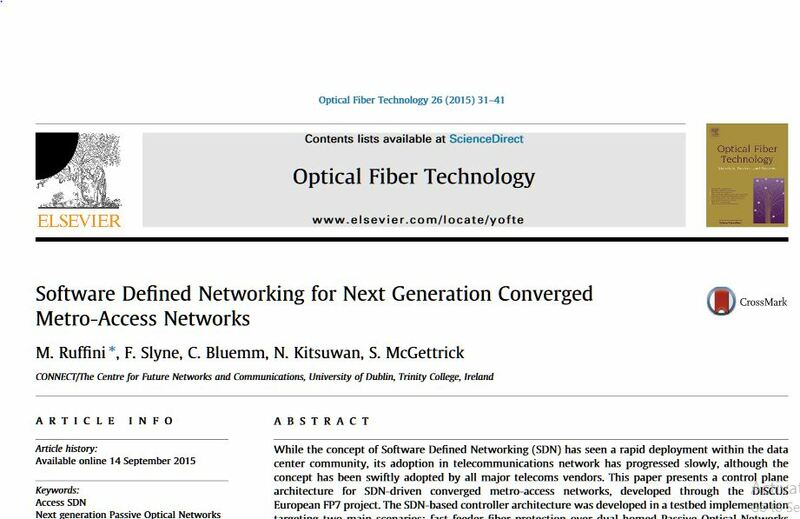 A paper on Software Defined Networks by Dr Marco Ruffini‘s team is among Top 5 most downloaded at Elsevier’s Optical Fiber Technology. You can read the paper here. Congratulations to authors Marco Ruffini, Christian Blümm, Nattapong Kitsuwan, Seamus McGettrick and Frank Slyne. This entry was posted in News on November 11, 2016 by Nima Afraz. Dr Marco Ruffini of the CONNECT Centre at Trinity College Dublin who will lead the O’SHARE telecoms research project. A €1 million telecoms research project, O’SHARE, has been launched at the Science Foundation Ireland (SFI) research centre, CONNECT, in Trinity College Dublin. Led by Dr Marco Ruffini, Assistant Professor in Optical Network Architectures in the School of Computer Science and Statistics, the four-year project will explore ways of improving the capacity of optical networks to cope with the surges in demand experienced at large gatherings such as concerts and sporting events. “O’SHARE is ultimately about sharing network resources to deliver better results for users,” according to Dr Ruffini.“Take the Electric Picnic, for example, when up to 50,000 people gather in a field in County Laois. The cellular network suddenly experiences a surge in demand – up to a thousand times more than usual. The available capacity reduces dramatically and using a mobile device to access Facebook or to share a video becomes very frustrating. “All mobile-phone masts are connected to a fibre-optic backhaul network. This will be the focus of O’SHARE’s work as we explore ways of dynamically allocating resources to areas of poor connectivity. The project, funded through the Science Foundation Ireland (SFI) Investigator Programme, will involve collaboration with several industry partners including Bell Labs and Vodafone. It will also see the recruitment of two senior researchers and two PhD students at the CONNECT Centre in Trinity. A €1 million four-year telecoms research project named O’SHARE has been launched at the Science Foundation Ireland (SFI) research centre, CONNECT, in Trinity College Dublin with the aim of exploring ways of improving the capacity of optical networks to cope with surges in demand. 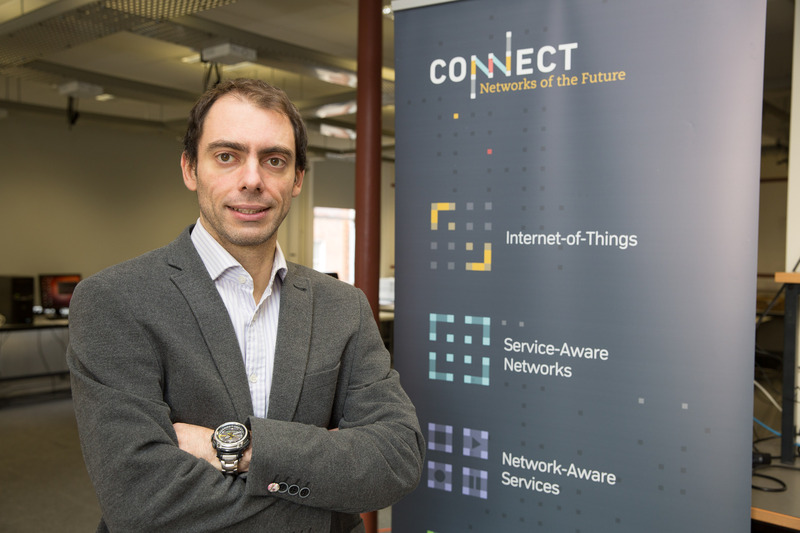 Led by Dr Marco Ruffini, Assistant Professor in Optical Network Architectures, the project will look at how the connectivity needs of large gatherings, such as concerts and sporting events, can be managed on a network infrastucture. O’SHARE is an open-access, SDN-driven architecture enabling multi-operator and multi-service convergence in shared access networks. “O’SHARE is ultimately about sharing network resources to deliver better results for users,” according to Dr Ruffini. “O’SHARE also plans to develop an international testbed to demonstrate Passive Optical Network virtualisation,” added Dr Ruffini. A €1 million telecoms research project, O’SHARE, has been launched at the Science Foundation Ireland (SFI) research centre, CONNECT, in Trinity College Dublin. Led by Dr Marco Ruffini, Assistant Professor in Optical Network Architectures, the four-year project will explore ways of improving the capacity of optical networks to cope with the surges in demand experienced at large gatherings such as concerts and sporting events. O’Share is an open access, software defined network-driven architecture enabling multi-operator and multi-service convergence in shared access networks. The project will focus on virtualisation of fibre-to-the-home (FTTH) networks to enable dynamic capacity assignment and multi-tenancy. “O’Share is ultimately about sharing network resources to deliver better results for users,” said Dr Ruffini. “Take a major concert, for example, when tens of thousands of people gather together. The cellular network suddenly experiences a surge in demand – up to a thousand times more than usual. The available capacity reduces dramatically and using a mobile device to access Facebook or to share a video becomes very frustrating. The project, funded through the Science Foundation Ireland (SFI) Investigator Programme, will involve collaboration with several industry partners including Bell Labs and Vodafone. It will also see the recruitment of two senior researchers and two PhD students at Trinity College. Trinity College Dublin’s (TCD) CONNECT Centre has signed a deal to begin a €1m telecoms research project dubbed O’SHARE to help festival goers access consistent mobile internet and phone signal in the face of a surge in demand. The O’SHARE project will be a four-year investigation that will explore ways of improving the capacity of optical networks to cope with the overload in capacity that is seen each year at major festivals and sporting events, like Electric Picnic and when major sporting events take place in stadiums like the Aviva and Croke Park. The Science Foundation Ireland (SFI) centre based in TCD is one of the country’s leading communications labs, led by Prof Linda Doyle, who was included on Siliconrepublic.com’s list of 25 key people influencing the internet of things last month. The work that will be undertaken by the O’SHARE project will look at how all mobile phone masts are connected to a fibre-optic backhaul network and, over the next four years, will explore ways of dynamically allocating resources to areas of poor connectivity. The team also plan to focus on developing multi-tenancy on the networks, allowing several service providers to operate the optical access networks at the same time. This, they say, will also lead to greater competition in the market, resulting in cheaper data plans for users. “O’SHARE is ultimately about sharing network resources to deliver better results for users,” said Dr Marco Ruffini, Assistant Professor in Optical Network Architectures, who will be leading the project. Dr Ruffini also added that the O’SHARE project will create an international testbed to develop communications technology. A €1 million telecoms research project, O’SHARE, has been launched at the Science Foundation Ireland (SFI) research centre, CONNECT, in Trinity College Dublin. 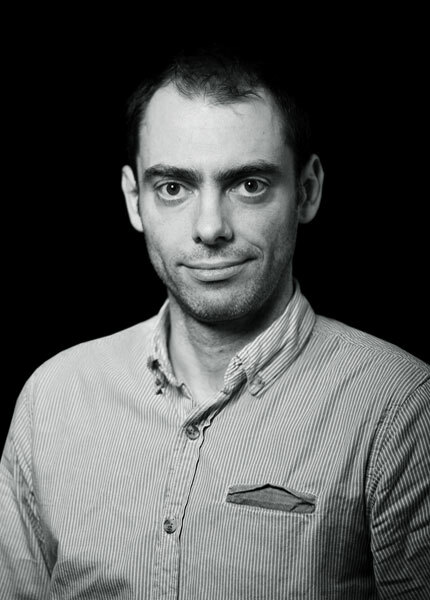 Led by Dr Marco Ruffini, Assistant Professor in Optical Network Architectures, the four-year project will explore ways of improving the capacity of optical networks to cope with the surges in demand experienced at large gatherings such as concerts and sporting events. “O’SHARE is ultimately about sharing network resources to deliver better results for users,” according to Dr Ruffini. “Take the Electric Picnic, for example, when up to 50,000 people gather in a field in County Laois. The cellular network suddenly experiences a surge in demand – up to a thousand times more than usual. The available capacity reduces dramatically and using a mobile device to access Facebook or to share a video becomes very frustrating. “We will also focus on multi-tenancy which allows several service providers to operate the optical access networks at the same time. This will also lead to greater competition in the market, resulting in cheaper data plans for users. This entry was posted in News on November 26, 2015 by Nima Afraz.